Hand-piped luxury Cupcakes with a petite sugar rose. 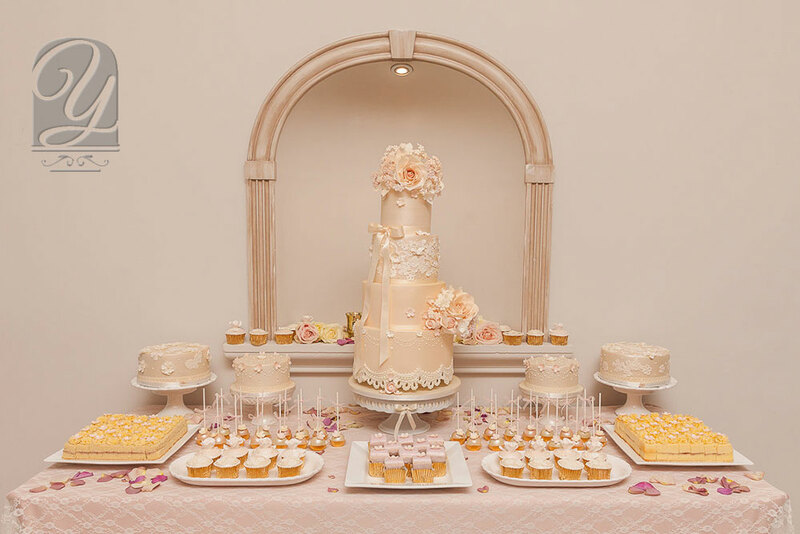 Our Elegant Rosie wedding cake is perfectly complemented by a lavish selection of moreish delicacies in a bespoke Dessert Table arrangement, designed and fashioned by Yevnig. With a treat to suit every taste, the Dessert Table contains co-ordinated luxury favours including, Cake Pops, Cupcakes, Petit Fours, Tray Bakes and separate Fruit Cakes for the nearest family members. The centrepiece cake is perfectly complemented by a lavish selection of moreish delicacies in a bespoke Dessert Table arrangement.